One of the primary inspirations behind this new site is that turning on higher intelligence is not only fun and joyous, it is absolutely necessary if we and our intelligent civilization are to survive the coming decades and expand out into the cosmos. By higher intelligence I mean the whole enchilada, whatever that is - not just greater intellect, but greater everything, greater emotional sanity, more love, compassion, creativity, inspiration, and most especially the transcendent experience itself and it's infinite expanse so raved about by psychonauts, shamans and eastern/yogic practioners. Yeah, there are some important things that really ought to converge more. If we need to avoid killing ourselves and the planet very effectively with the rapidly accelerating wonders of technology, we need to get a whole lot smarter and wiser very quickly as well. 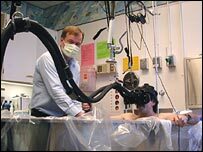 BBC Article talks about how a doctor in a burn center in a hospital in Seattle has had great success using Virtual Reality to help burn victims not feel so much pain. Hoffman's virtual worlds, which he calls by names such as SnowWorld or SpiderWorld, are designed to immerse the user so deeply in the virtual experience that their attention is distracted away from the pain. SnowWorld, for instance, takes users on an absorbing virtual journey through glaciers and ice caves whilst having to defend themselves from attack by polar bears and penguins. Mike Robinson, a patient who has undergone the virtual reality treatment, said it helped him to overcome the extreme discomfort he felt when his dressings were changed. "My pain when the nurse is changing my bandages is consistently extreme," he told BBC News Online. "But during the time I was in VR, I was pretty much unaware that the nurse was even working on my wound. "I mean, at some level I knew she was working on me, but I wasn't thinking about it because I was inside that SnowWorld." That's pretty brilliant. And it goes on to touch on brain chemistry and neurology as to why that might be. Well, another way of looking at it could simply be that you aren't feeling pain if you aren't "in your body". So, if you aren't a fakir who can have an out-of-body experience at will, putting most of your attention into exploring a VR game is obviously a very practical idea. And there's this great quote from the doctor. "Pain requires conscious attention. Humans have a limited amount of this and it's hard to do two things at once,"
Yeah, particularly if you're a man. "It is disturbing to observe the adverse effect of some U.S. policies on the less-developed nations. Despite helpful contributions of USAID and military assistance in Mali, for instance, the grossly exorbitant cotton subsidies for mega-farms in America cost the country far more than all the combined assistance from rich nations. Malians produced more cotton last year than any other African country and it is their number one export, but they had to sell it with no profit in order to compete with the heavily subsidized U.S. crop. Also, there is a heavy-handed effort by Washington to force other countries to violate the basic premises of the newly established International Criminal Court. Our government threatens to withhold military assistance unless they will guarantee that U.S. citizens be immune to possible punishment for war crimes or other atrocities. Another interesting development has been the efforts from Washington to elevate the issue of terrorism, and American diplomatic officials are forced to participate in this over-emphasis. We were warned strenuously about the new terrorist dangers that had arisen when we planned our visit to Timbuktu and Mopti. I decided that we would take a chance, and when we met with representatives of a dozen donor agencies in Bamako, I asked if any of them had any evidence of increased violence in the area or terrorist threats. The unanimous response was laughter." How about running for president again, Mr.Carter. It is apparently hard to find humble and knowledgable folks who're willing to roll up their sleeves. Just another of our little ongoing discoveries of how daily life in Toulouse, France is different from life in Los Angeles. The day before yesterday some fliers were handed out on the block, inviting us to an open house Friday in a building in the neighborhood, which apparently is a former factory that is going to be a center for an artist's collective called Mix'Art Myrys. They want to meet their future neighbors and shake hands and see who we are and hear if there's any issues we have with anything. How very nice. It is actually quite a common thing here that when there's some kind of new semi-public project of any magnitude there will be public hearings and all the stakeholders are invited to participate and voice what they think, etc. But now, yesterday night, we get another set of fliers in our mailbox about the same thing. This time from the Mairie, the mayor's office. Handed out by what obviously was some public office workers. They included a statement from the mayor that he was very surprised that Mix'Art Myrys had decided to move into that old factory, as he had advised them against it, and he was very much against the idea, even though he thinks that alternative cultural activities should generally be supported. And it included contact information for calling telling the Mairie if we really don't want these guys to move in. But the killer is then the added information that apparently this is some kind of squatter group. They had previously illegally moved into nothing less than the old Prefecture, a key government building, and stayed there for three years, running their artist collective and having exhibitions, etc. And they apparently don't have any kind of authorization to move into this new building. Meaning, they don't own it, even though they're in some kind of talks with the owner, and it isn't zoned for this use, and the Mayor doesn't really want our quiet neighborhood to be subject to the activities that this group apparently is known for. Which I'm not quite clear on what is, as the website is kind of cryptic, but it includes theater for kids at least. Now, if this were the United States, and some sort of large anarchic art group was making moves to take over an abandoned factory without permission, and they'd even done it before - we'd be talking tanks and tear gas, and some dead bodies would be quite likely. Instead we get a letter from the mayor pleading with us, the local citizens, to support his case and voice our opinion. Which apparently is what decides things. And everybody, the government officials and the anarcho art squatters, are apparently very intent on having an open public dialog with everybody, having everybody over for tea and cookies, to sway them with good arguments. I suppose we'll go and see what actually happens.